Haplogroup R1a, or haplogroup R-M420, is a human Y-chromosome DNA haplogroup which is distributed in a large region in Eurasia, extending from Scandinavia and Central Europe to southern Siberia and South Asia. While R1a originated ca. 22,000 to 25,000 years ago, its subclade M417 (R1a1a1) diversified ca. 5,800 years ago. The distribution of M417-subclades R1a-Z282 (including R1a-Z280) in Central and Eastern Europe and R1a-Z93 in Asia suggests that R1a1a diversified within the Eurasian Steppes or the Middle East and Caucasus region. The place of origin of these subclades plays a role in the debate about the origins of Proto-Indo-Europeans. The SNP mutation R-M420 was discovered after R-M17 (R1a1a), which resulted in a reorganization of the lineage in particular establishing a new paragroup (designated R-M420*) for the relatively rare lineages which are not in the R-SRY10831.2 (R1a1) branch leading to R-M17. 5 Historic naming of "R1a"
The split of R1a (M420) is computed to ca. 22,000, or 25,000 years ago, which is the time of the last glacial maximum. A large, 2014 study by Peter A. Underhill et al., using 16,244 individuals from over 126 populations from across Eurasia, concluded that there was compelling evidence that "the initial episodes of haplogroup R1a diversification likely occurred in the vicinity of present-day Iran." According to Underhill (2014), the downstream R1a-M417 subclade diversified into Z282 and Z93 circa 5,800 years ago. [note 1] Even though R1a occurs as the most frequent Y-chromosome haplogroup among populations speaking a wide variety of languages such as Slavic, Indo-Iranian, Dravidian, Turkic and Finno-Ugric, the question of the origins of R1a1a is relevant to the ongoing debate concerning the urheimat of the Proto-Indo-European people, and may also be relevant to the origins of the Indus Valley Civilisation. R1a shows a strong correlation with Indo-European languages of Southern and Western Asia and Central and Eastern Europe, being most prevalent in Eastern Europe, West Asia, South Asia and Central Asia. In Europe, Z282 is prevalent particularly while in Asia Z93 dominates. The connection between Y-DNA R-M17 and the spread of Indo-European languages was first noted by T. Zerjal and colleagues in 1999. Kivisild et al. (2003) have proposed either south or west Asia,[note 2] while Mirabal et al. (2009) see support for both south and central Asia. Other studies suggest Ukrainian, Central Asian and West Asian origins for R1a1a. Inner and Central Asia is an overlap zone for the R1a1-Z280 and R1a1-Z93 lineages [which] implies that an early differentiation zone of R1a1-M198 conceivably occurred somewhere within the Eurasian Steppes or the Middle East and Caucasus region as they lie between South Asia and Central- and Eastern Europe." Three genetic studies in 2015 gave support to the Kurgan theory of Gimbutas regarding the Indo-European Urheimat. According to those studies, haplogroups R1b and R1a, now the most common in Europe (R1a is also common in South Asia) would have expanded from the Russian steppes, along with the Indo-European languages; they also detected an autosomal component present in modern Europeans which was not present in Neolithic Europeans, which would have been introduced with paternal lineages R1b and R1a, as well as Indo-European languages. David Anthony considers the Yamnaya culture to be the Indo-European Urheimat. According to Haak et al. (2015), a massive migration from the Yamnaya culture northwards took place ca. 2,500 BCE, accounting for 75% of the genetic ancestry of the Corded Ware culture, noting that R1a and R1b may have "spread into Europe from the East after 3,000 BCE". Yet, all their seven Yamnaya samples belonged to the R1b-M269 subclade, but no R1a1a has been found in their Yamnaya samples. This raises the question where the R1a1a in the Corded Ware culture came from, if it was not from the Yamnaya culture. Part of the South Asian genetic ancestry derives from west Eurasian populations, and some researchers have implied that Z93 may have come to India via Iran and expanded there during the Indus Valley Civilisation. Mascarenhas et al. (2015) note that the roots of Z93 lie in West Asia, and propose that "Z93 and L342.2 expanded in a southeasterly direction from Transcaucasia into South Asia," noting that such an expansion is compatible with "the archeological records of eastward expansion of West Asian populations in the 4th millennium BCE culminating in the so-called Kura-Araxes migrations in the post-Uruk IV period." Yet, Lazaridis noted that sample I1635 of Lazaridis et al. (2016), their Armenian Kura-Araxes sample, carried Y-haplogroup R1b1-M415(xM269)[note 6] (also called R1b1a1b-CTS3187). Kivisild et al. (2003) have proposed either South or West Asia,[note 2] while Mirabal et al. (2009) see support for both South and Central Asia. South Asian populations have the highest STR diversity within R1a1a, and subsequent older TMRCA datings, and R1a1a is present among both higher (Brahmin) castes and lower castes, although the presence is substantially higher among Brahmin castes. From these findings some researchers have concluded that R1a1a originated in South Asia,[note 11] excluding a substantial genetic influx from Indo-European migrants. However, this diversity, and the subsequent older TMRCA-datings, can also be explained by the historically high population numbers, which increases the likelihood of diversification and microsatellite variation. According to Sengupta et al. (2006), "[R1a1 and R2] could have actually arrived in southern India from a southwestern Asian source region multiple times. "[note 12] Silva et al. (2017) noted that R1a in South Asia most "likely spread from a single Central Asian source pool, there do seem to be at least three and probably more R1a founder clades within the Subcontinent, consistent with multiple waves of arrival." R1a is distinguished by several unique markers, including the M420 mutation. It is a subclade of Haplogroup R-M173 (previously called R1). R1a has the sister-subclades Haplogroup R1b-M343, and the paragroup R-M173*. R-M420, defined by the mutation M420, has two branches: R-SRY1532.2, defined by the mutation SRY1532.2, which makes up the vast majority; and R-M420*, the paragroup, defined as M420 positive but SRY1532.2 negative. (In the 2002 scheme, this SRY1532.2 negative minority was one part of the relatively rare group classified as the paragroup R1*.) Mutations understood to be equivalent to M420 include M449, M511, M513, L62, and L63. Only isolated samples of the new paragroup R-M420* were found by Underhill 2009, mostly in the Middle East and Caucasus: 1/121 Omanis, 2/150 Iranians, 1/164 in the United Arab Emirates, and 3/612 in Turkey. Testing of 7224 more males in 73 other Eurasian populations showed no sign of this category. R1a1 is defined by SRY1532.2 or SRY10831.2 (understood to always include SRY10831.2, M448, L122, M459, and M516). This family of lineages is dominated by M17 and M198. In contrast, paragroup R-SRY1532.2* lacks either the M17 or M198 markers. The R-SRY1532.2* paragroup is apparently less rare than R1*, but still relatively unusual, though it has been tested in more than one survey. Underhill et all. (2009) reported 1/51 in Norway, 3/305 in Sweden, 1/57 Greek Macedonians, 1/150 Iranians, 2/734 ethnic Armenians, and 1/141 Kabardians. Sahoo et al. (2006) reported R-SRY1532.2* for 1/15 Himachal Pradesh Rajput samples. R1a1a1 (R-M417) is the most widely found subclade, in two variations which are found respectively in Europe (R1a1a1b1 (R-Z282) ([R1a1a1a*] (R-Z282) (Underhill 2014/2015)) and Central and South Asia (R1a1a1b2 (R-Z93) ([R1a1a2*] (R-Z93) Underhill 2014/2015)). This large subclade appears to encompass most of the R1a1a found in Europe. R1a1a1c (M64.2, M87, M204) is apparently rare: it was found in 1 of 117 males typed in southern Iran. R-M458 is a mainly Slavic SNP, characterized by its own mutation, and was first called cluster N. Underhill et al. (2009) found it to be present in modern European populations roughly between the Rhine catchment and the Ural Mountains and traced it to "a founder effect that [...] falls into the early Holocene period, 7.9±2.6 KYA." M458 was found in one skeleton from a 14th-century grave field in Usedom, Mecklenburg-Vorpommern, Germany. The paper by Underhill et al. (2009) also reports a surprisingly high frequency of M458 in some Northern Caucasian populations (for example 27.5% among Karachays and 23.5% among Balkars, 7.8% among Karanogays and 3.4% among Abazas). R1a1a1b1a1a (R-L260), commonly referred to as West Slavic or Polish, is a subclade of the larger parent group R-M458, and was first identified as an STR cluster by Pawlowski 2002 and then by Gwozdz 2009. Thus, R-L260 was what Gwozdz 2009 called cluster "P." In 2010 it was verified to be a haplogroup identified by its own mutation (SNP). It apparently accounts for about 8% of Polish men, making it the most common subclade in Poland. Outside of Poland it is less common (Pawlowski 2002). In addition to Poland, it is mainly found in the Czech Republic and Slovakia, and is considered "clearly West Slavic." The founding ancestor of R-L260 is estimated to have lived between 2000 and 3000 years ago, i.e. during the Iron Age, with significant population expansion less than 1,500 years ago. R-M334 ([R1a1a1g1], a subclade of [R1a1a1g] (M458) c.q. R1a1a1b1a1 (M458)) was found by Underhill et al. (2009) only in one Estonian man and may define a very recently founded and small clade. R1a1a1b1a2b3* (M417+, Z645+, Z283+, Z282+, Z280+, CTS1211+, CTS3402, Y33+, CTS3318+, Y2613+) (Gwozdz's Cluster K) is a STR based group that is R-M17(xM458). This cluster is common in Poland but not exclusive to Poland. R1a1a1b1a2b3a (R-L365) was early called Cluster G.
Table only shows positive sets from N = 3667 derived from 60 Eurasian populations sample. This large subclade appears to encompass most of the R1a1a found in Asia. R-Z93* or R1a1a1b2* (R1a1a2* in Underhill (2014)) is most common (>30%) in the South Siberian Altai region of Russia, cropping up in Kyrgyzstan (6%) and in all Iranian populations (1–8%). R-Z2125 occurs at highest frequencies in Kyrgyzstan and in Afghan Pashtuns (>40%). At a frequency of >10%, it is also observed in other Afghan ethnic groups and in some populations in the Caucasus and Iran. R-M434 is a subclade of Z2125. It was detected in 14 people (out of 3667 people tested), all in a restricted geographical range from Pakistan to Oman. This likely reflects a recent mutation event in Pakistan. R-M560 is very rare and was only observed in four samples: two Burushaski speakers (north Pakistan), one Hazara (Afghanistan), and one Iranian Azerbaijani. R-M780 occurs at high frequency in South Asia: India, Pakistan, Afghanistan, and the Himalayas. The group also occurs at >3% in some Iranian populations and is present at >30% in Roma from Croatia and Hungary. Haplogroup R1a has been found in ancient fossils associated with the Corded Ware culture and Urnfield culture;[unreliable source?] as well as the burial of the remains of the Sintashta culture, Andronovo culture, the Pazyryk culture, Tagar culture and Tashtyk culture, the inhabitants of ancient Tanais, in the Tarim mummies, the aristocracy Xiongnu, in two ancient Khazar fossils. The skeletal remains of a father and his two sons, from an archaeological site discovered in 2005 near Eulau (in Saxony-Anhalt, Germany) and dated to about 2600 BCE, tested positive for the Y-SNP marker SRY10831.2. The Ysearch number for the Eulau remains is 2C46S. The ancestral clade was thus present in Europe at least 4600 years ago, in association with one site of the widespread Corded Ware culture. In Europe, the R1a1 sub-clade is found at highest levels among peoples of Central and Eastern European descent, with results ranging from 35-65% among Czechs, Hungarians, Poles, Slovaks, western Ukrainians (particularly Rusyns), Belarusians, Moldovans, and Russians. In the Baltics, R1a1a frequencies decrease from Lithuania (45%) to Estonia (around 30%). There is a significant presence in peoples of Scandinavian descent, with highest levels in Norway and Iceland, where between 20 and 30% of men are in R1a1a. Vikings and Normans may have also carried the R1a1a lineage westward; accounting for at least part of the small presence in the British Isles. In East Germany, where Haplogroup R1a1a reaches a peak frequency in Rostock at a percentage of 31.3%, it averages between 20 and 30%. In Southern Europe R1a1a is not common, but significant levels have been found in pockets, such as in the Pas Valley in Northern Spain, areas of Venice, and Calabria in Italy. The Balkans shows lower frequencies, and significant variation between areas, for example more than 30% in Slovenia, Croatia and Greek Macedonia, but less than 10% in Albania, Kosovo and parts of Greece. R1a is virtually composed only of the Z284 subclade in Scandinavia, which is only found in single sample of a Slovenian in Eastern Europe, where the main subclade is Z282 (Z280 and M458) and there is a negligible representation of Z93 in each region other than Turkey. The West Slavs and Hungarians are characterized by a high frequency of the subclade M458 and a low Z92, a subclade of Z280. Hundreds of samples of each Slovenians, and Czechs lack the Z92 subclade of Z280, while Poles, Slovaks, Croats and Hungarians only show a very low frequency of Z92. The Balts, East Slavs, Serbs, Macedonians, Bulgarians and Romanians demonstrate a ratio Z280>M458 and a high, up to a prevailing share of Z92. Balts and East Slavs have the same subclades and similar frequencies in a more detailed phylogeny of the subclades. The Russian geneticist Oleg Balanovsky speculated that there is a predominance of the assimilated pre-Slavic substrate in the genetics of East and West Slavic populations, according to him the common genetic structure which contrasts East Slavs and Balts from other populations may suggest the explanation that the pre-Slavic substrate of the East Slavs consisted most significantly of Baltic-speakers, which at one point predated the Slavs in the cultures of the Eurasian steppe according to archaeological and toponymic references. In Afghanistan, R1a1a is found at 51% among the Pashtuns - and 30% among the Tajiks. It is less frequent among the Hazaras (7%) and the Uzbeks (18%). In South Asia, R1a1a has often been observed with high frequency in a number of demographic groups. In India, high frequencies of this haplogroup is observed in West Bengal Brahmins (72%) to the east, Gujarat Lohanas (60%)  to the west, Khatris (67%) in the north and Iyengar Brahmins (31%) in the south. It has also been found in several South Indian Dravidian-speaking Adivasis including the Chenchu (26%) and the Valmikis of Andhra Pradesh, Kota (22.58%) and the Kallar of Tamil Nadu suggesting that R1a1a is widespread in Tribal Southern Indians. Besides these, studies show high percentages in regionally diverse groups such as Manipuris (50%) to the extreme North East and among Punjabis (47%) to the extreme North West. In Pakistan it is found at 71% among the Mohanna tribe in Sindh province to the south and 46% among the Baltis of Gilgit-Baltistan to the north. Among the Sinhalese of Sri Lanka, 23% were found to be R1a1a (R-SRY1532) positive. Hindus of Chitwan District in the Terai region Nepal show it at 69%. The frequency of R1a1a is comparatively low among some Turkic-speaking groups including Turks, Azeris, Kazakhs, and Yakuts, yet levels are higher (19 to 28%) in certain Turkic or Mongolic-speaking groups of Northwestern China, such as the Bonan, Dongxiang, Salar, and Uyghurs. A Chinese paper published in 2018 found R1a-Z94 in 38.5% (15/39) of a sample of Keriyalik Uyghurs from Darya Boyi/Darya Boye Village, Yutian/Keriya County, Xinjiang (于田县达里雅布依乡), R1a-Z93 in 28.9% (22/76) of a sample of Dolan Uyghurs from Horiqol township, Awat County, Xinjiang (阿瓦提县乌鲁却勒镇), and R1a-Z93 in 6.3% (4/64) of a sample of Loplik Uyghurs from Karquga/Qarchugha Village, Yuli/Lopnur County, Xinjiang (尉犁县喀尔曲尕乡). R1a(xZ93) was observed only in one of 76 Dolan Uyghurs. Note that Darya Boyi Village is located in a remote oasis formed by the Keriya River in the Taklamakan Desert. In a 2014 paper, R1a1a has been detected in 1.8% (2/110) of the samples of Han Chinese who tested. These collected two samples of R-M17, R-M198, R-M434, R-M458 for both belonged to Han Chinese from Fujian and Shanxi provinces. In Eastern Siberia, R1a1a is found among certain indigenous ethnic groups including Kamchatkans and Chukotkans, and peaking in Itel'man at 22%. Wells 2001, noted that in the western part of the country, Iranians show low R1a1a levels, while males of eastern parts of Iran carried up to 35% R1a1a. Nasidze 2004 found R1a1a in approximately 20% of Iranian males from the cities of Tehran and Isfahan. Regueiro 2006 in a study of Iran, noted much higher frequencies in the south than the north. A newer Study has found 20.3% R-M17* among Kurdish samples which were taken in the Kurdistan Province in western Iran, 9.7% among Mazandaranis in North Iran in the province of Mazandaran, 9.4% among Gilaks in province of Gilan, 12.8% among Persian and 17.6% among Zoroastrians in Yazd, 18.2% among Persians in Isfahan, 20.3% among Persians in Khorasan, 16.7% Afro-Iranians, 18.4% Qeshmi "Gheshmi", 21.4% among Persian Speaking Bandari people in Hormozgan and 25% among the Baloch people in Sistan and Baluchestan Province. Haplogroup R1a1a was found at elevated levels among a sample of the Israeli population who self-designated themselves as Levites and Ashkenazi Jews (Levites comprise approximately 4% of Jews). Behar reported R1a1a to be the dominant haplogroup in Ashkenazi Levites (52%), although rare in Ashkenazi Cohanim (1.3%). Further to the north of these Middle Eastern regions on the other hand, R1a1a levels start to increase in the Caucasus, once again in an uneven way. 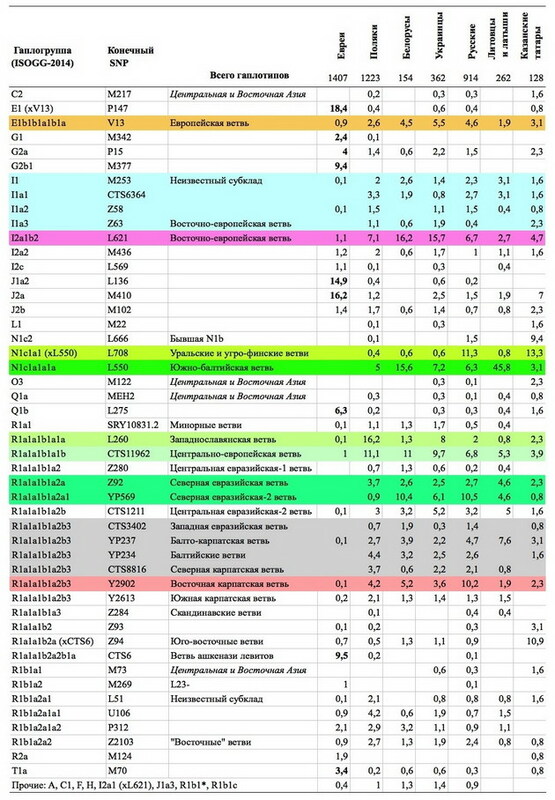 Several populations studied have shown no sign of R1a1a, while highest levels so far discovered in the region appears to belong to speakers of the Karachay-Balkar language among whom about one quarter of men tested so far are in haplogroup R1a1a. Bryan Sykes in his book Blood of the Isles gives imaginative names to the founders or "clan patriarchs" of major British Y haplogroups, much as he did for mitochondrial haplogroups in his work The Seven Daughters of Eve. He named R1a1a in Europe the "clan" of a "patriarch" Sigurd, reflecting the theory that R1a1a in the British Isles has Norse origins. The historic naming system commonly used for R1a was inconsistent in different published sources, because it changed often; this requires some explanation. In 2002, the Y Chromosome Consortium (YCC) proposed a new naming system for haplogroups (YCC 2002), which has now become standard. In this system, names with the format "R1" and "R1a" are "phylogenetic" names, aimed at marking positions in a family tree. Names of SNP mutations can also be used to name clades or haplogroups. For example, as M173 is currently the defining mutation of R1, R1 is also R-M173, a "mutational" clade name. When a new branching in a tree is discovered, some phylogenetic names will change, but by definition all mutational names will remain the same. The widely occurring haplogroup defined by mutation M17 was known by various names, such as "Eu19", as used in (Semino 2000) in the older naming systems. The 2002 YCC proposal assigned the name R1a to the haplogroup defined by mutation SRY1532.2. This included Eu19 (i.e. R-M17) as a subclade, so Eu19 was named R1a1. Note, SRY1532.2 is also known as SRY10831.2 The discovery of M420 in 2009 has caused a reassignment of these phylogenetic names. (Underhill 2009 and ISOGG 2012) R1a is now defined by the M420 mutation: in this updated tree, the subclade defined by SRY1532.2 has moved from R1a to R1a1, and Eu19 (R-M17) from R1a1 to R1a1a. More recent updates recorded at the ISOGG reference webpage involve branches of R-M17, including one major branch, R-M417. ^ According to Family Tree, they diversified ca. 5,000 years ago. ^ a b Kivisild et al. (2003): "Haplogroup R1a, previously associated with the putative Indo-Aryan invasion, was found at its highest frequency in Punjab but also at a relatively high frequency (26%) in the Chenchu tribe. This finding, together with the higher R1a-associated short tandem repeat diversity in India and Iran compared with Europe and central Asia, suggests that southern and western Asia might be the source of this haplogroup." 5. Haak W. et al. Massive migration from the steppe is a source for Indo-European languages in Europe. doi:10.1101/013433. 8. Chekunova Е.М., Yartseva N.V., Chekunov М.К., Мazurkevich А.N. The First Results of the Genotyping of the Aboriginals and Human Bone Remains of the Archeological Memorials of the Upper Podvin’e. // Archeology of the lake settlements of IV—II Thousands BC: The chronology of cultures and natural environment and climatic rhythms. Proceedings of the International Conference, Devoted to the 50-year Research of the Pile Settlements on the North-West of Russia. St. Petersburg, 13–15 November 2014. ^ Yet, Haak et al. also explicitly state: "...a type of Near Eastern ancestry different from that which was introduced by early farmers." ^ According to Family Tree DNA, L664 formed 4,700 ybp, that is, 2,700 BCE. ^ Lazaridis, Twitter, 18 juni 2016: "I1635 (Armenia_EBA) is R1b1-M415(xM269). We'll be sure to include in the revision. Thanks to the person who noticed! #ILovePreprints." See also Eurogenes Blog, Big deal of 2016: the territory of present-day Iran cannot be the Indo-European homeland, for a discussion of the same topic. ^ According to Family Tree DNA, M780 formed 4700 ybp. This dating coincides with the eastward movement between 2800 and 2600 BCE of the Yamnaya culture into the region of the Poltavka culture, a predecessor of the Sintashta culture, from which the Indo-Iranians originated. M780 is concentrated in the Ganges Vally, the locus of the classic Vedic society. ^ Poznik et al. (2026) calculate with a generation time of 30 years; a generation time of 20 years yields other results. ^ "The evidence that the Steppe_MLBA [Middle to Late Bronze Age] cluster is a plausible source for the Steppe ancestry in South Asia is also supported by Y chromosome evidence, as haplogroup R1a which is of the Z93 subtype common in South Asia today [Underhill et al 2015, M. Silva et al 2017] was of high frequency in Steppe_MLBA (68%) (16), but rare in Steppe_EMBA [Early to Middle Bronze Age] (absent in our data)." Sahoo et al. (2006): "... one should expect to observe dramatically lower genetic variation among Indian Rla lineages. In fact, the opposite is true: the STR haplotype diversity on the background of R1a in Central Asia (and also in Eastern Europe) has already been shown to be lower than that in India (6). Rather, the high incidence of R1* and Rla throughout Central Asian European populations (without R2 and R* in most cases) is more parsimoniously explained by gene flow in the opposite direction, possibly with an early founder effect in South or West Asia. Sharma et al. (2009): "A peculiar observation of the highest frequency (up to 72.22%) of Y-haplogroup R1a1* in Brahmins hinted at its presence as a founder lineage for this caste group. Further, observation of R1a1* in different tribal population groups, existence of Y-haplogroup R1a* in ancestors and extended phylogenetic analyses of the pooled dataset of 530 Indians, 224 Pakistanis and 276 Central Asians and Eurasians bearing the R1a1* haplogroup supported the autochthonous origin of R1a1 lineage in India and a tribal link to Indian Brahmins. However, it is important to discover novel Y-chromosomal binary marker(s) for a higher resolution of R1a1* and confirm the present conclusions." ^ Sengupta et al. (2006): "The widespread geographic distribution of HG R1a1-M17 across Eurasia and the current absence of informative subdivisions defined by binary markers leave uncertain the geographic origin of HG R1a1-M17. However, the contour map of R1a1-M17 variance shows the highest variance in the northwestern region of India [...] The question remains of how distinctive is the history of L1 relative to some or all of R1a1 and R2 representatives. This uncertainty neutralizes previous conclusions that the intrusion of HGs R1a1 and R2 from the northwest in Dravidian-speaking southern tribes is attributable to a single recent event. [R1a1 and R2] could have actually arrived in southern India from a southwestern Asian source region multiple times, with some episodes considerably earlier than others. Considerable archeological evidence exists regarding the presence of Mesolithic peoples in India (Kennedy 2000), some of whom could have entered the subcontinent from the northwest during the late Pleistocene epoch. The high variance of R1a1 in India (table 12), the spatial frequency distribution of R1a1 microsatellite variance clines (fig. 4), and expansion time (table 11) support this view." ^ a b c d e f g Sharma 2009. ^ a b c d e f g h i Underhill 2014. ^ a b c d e f g h i j k l m n o p Underhill 2009. ^ a b Underhill 2014, p. 130. ^ a b c d e Pamjav 2012. ^ a b Karafet, Tatiana; Mendez, Fernando; Sudoyo, Herawati (2014). "Improved phylogenetic resolution and rapid diversification of Y-chromosome haplogroup K-M526 in Southeast Asia". Nature. 23 (3): 369–373. doi:10.1038/ejhg.2014.106. PMC 4326703. PMID 24896152. ^ Underhill, PA; Myres, NM; Rootsi, S; Metspalu, M; Zhivotovsky, LA; King, RJ; Lin, AA; Chow, CE; Semino, O; Battaglia, V; Kutuev, I; Järve, M; Chaubey, G; Ayub, Q; Mohyuddin, A; Mehdi, SQ; Sengupta, S; Rogaev, EI; Khusnutdinova, EK; Pshenichnov, A; Balanovsky, O; Balanovska, E; Jeran, N; Augustin, DH; Baldovic, M; Herrera, RJ; Thangaraj, K; Singh, V; Singh, L; Majumder, P; Rudan, P; Primorac, D; Villems, R; Kivisild, T (2010). "Separating the post-Glacial coancestry of European and Asian Y chromosomes within haplogroup R1a". Eur. J. Hum. Genet. 18 (4): 479–84. doi:10.1038/ejhg.2009.194. PMC 2987245. PMID 19888303. ^ a b c d Mirabal 2009. ^ a b c d e Kivisild 2003. ^ a b c d Semino 2000. ^ a b c Wells 2001. ^ a b Regueiro 2006. ^ Ornella Semino, Giuseppe Passarino, Peter J. Oefner, Alice A. Lin, Svetlana Arbuzova, Lars E. Beckman, Giovanna De Benedictis, Paolo Francalacci, Anastasia Kouvatsi, Svetlana Limborska, Mladen Marciki, Anna Mika, Barbara Mika, Dragan Primorac, A. Silvana Santachiara-Benerecetti, L. Luca Cavalli-Sforza, Peter A. Underhill, The Genetic Legacy of Paleolithic Homo sapiens sapiens in Extant Europeans: A Y Chromosome Perspective, Science, vol. 290 (10 November 2000), pp. 1155–1159. ^ a b Haak 2015, p. 5. ^ Semenov & Bulat 2016. ^ Semenov & Bulat 2016, p. 41. ^ Haak 2015, p. 4. ^ a b c Mascarenhas 2015, p. 9. ^ Pozink 2016, p. 5. ^ Poznik 2016, p. 5. ^ a b Narasimhan 2018. ^ a b c d e f g Sengupta 2006. ^ a b c d e Sahoo 2006. ^ a b Thangaraj 2010. ^ Sahoo 2006, p. 845-846. ^ a b Silva 2017. ^ a b c d e f g h Underhill 2015. ^ a b c d e f g h i j k l m Underhill 2015, p. 125. ^ a b (Pamjav 2012). ^ J. Freder, Die mittelalterlichen Skelette von Usedom [The mediaeval skeletons of Usedom], Berlin 2010, p. 86 (Dissertation Free University Berlin 2010). ^ a b Gwozdz 2009. ^ a b c d "Underhill et al. 2014" (PDF). Archived from the original (PDF) on 2016-08-16. Retrieved 2016-06-12. ^ Underhill, Peter A; Myres, Natalie M; Rootsi, Siiri; Metspalu, Mait; Zhivotovsky, Lev A; King, Roy J; Lin, Alice A; Chow, Cheryl-Emiliane T; Semino, Ornella (2009-11-04). "Separating the post-Glacial coancestry of European and Asian Y chromosomes within haplogroup R1a". European Journal of Human Genetics. 18 (4): 479–484. doi:10.1038/ejhg.2009.194. ISSN 1018-4813. PMC 2987416. PMID 19888303. ^ Haak, Wolfgang; Brandt, Guido; Jong, Hylke N. de; Meyer, Christian; Ganslmeier, Robert; Heyd, Volker; Hawkesworth, Chris; Pike, Alistair W. G.; Meller, Harald; Alt, Kurt W. (25 November 2008). "Ancient DNA, Strontium isotopes, and osteological analyses shed light on social and kinship organization of the Later Stone Age". PNAS. 105 (47): 18226–18231. Bibcode:2008PNAS..10518226H. doi:10.1073/pnas.0807592105. PMC 2587582. PMID 19015520. ^ Brandit, G (2013). "Ancient DNA Reveals Key Stages in the Formation of Central European Mitochondrial Genetic Diversity". Science. 342 (6155): 257–261. Bibcode:2013Sci...342..257B. doi:10.1126/science.1241844. PMC 4039305. PMID 24115443. ^ Schweitzer, D. (23 March 2008). "Lichtenstein Cave Data Analysis" (PDF). dirkschweitzer.net. Archived from the original (PDF) on 14 August 2011. ^ a b c Keyser, Christine; Bouakaze, Caroline; Crubézy, Eric; Nikolaev, Valery G.; Montagnon, Daniel; Reis, Tatiana; Ludes, Bertrand (2009). "Ancient DNA provides new insights into the history of south Siberian Kurgan people". Human Genetics. 126 (3): 395–410. doi:10.1007/s00439-009-0683-0. ISSN 0340-6717. PMID 19449030. ^ Ricaut, F.; et al. (2004). "Genetic Analysis of a Scytho-Siberian Skeleton and Its Implications for Ancient Central Asian Migrations". Human Biology. 76: 1. doi:10.1353/hub.2004.0025. ^ Корниенко И. В., Водолажский Д. И. Использование нерекомбинантных маркеров Y-хромосомы в исследованиях древних популяций (на примере поселения Танаис)//Материалы Донских антропологических чтений. Ростов-на-Дону, Ростовский научно-исследовательский онкологический институт, Ростов-на-Дону, 2013. ^ Chunxiang, Li; et al. (2010). "Evidence that a West-East admixed population lived in the Tarim Basin as early as the early Bronze Age" (PDF). BMC Biology. 8 (1): 15. doi:10.1186/1741-7007-8-15. ISSN 1741-7007. PMC 2838831. PMID 20163704. Archived from the original (PDF) on 27 April 2011. ^ Kim, Kijeong; Brenner, Charles H.; Mair, Victor H.; Lee, Kwang-Ho; Kim, Jae-Hyun; Gelegdorj, Eregzen; Batbold, Natsag; Song, Yi-Chung; Yun, Hyeung-Won; Chang, Eun-Jeong; Lkhagvasuren, Gavaachimed; Bazarragchaa, Munkhtsetseg; Park, Ae-Ja; Lim, Inja; Hong, Yun-Pyo; Kim, Wonyong; Chung, Sang-In; Kim, Dae-Jin; Chung, Yoon-Hee; Kim, Sung-Su; Lee, Won-Bok; Kim, Kyung-Yong (2010). "A western Eurasian male is found in 2000-year-old elite Xiongnu cemetery in Northeast Mongolia". American Journal of Physical Anthropology. 142 (3): 429–440. doi:10.1002/ajpa.21242. ISSN 0002-9483. PMID 20091844. ^ a b Behar 2003. ^ a b Rosser 2000. ^ П, Балановский О. (2015-11-30). Генофонд Европы (in Russian). KMK Scientific Press. ISBN 9785990715707. Прежде всего, это преобладание в славянских популяциях дославянского субстрата — двух ассимилированных ими генетических компонентов – восточноевропейского для западных и восточных славян и южноевропейского для южных славян...Можно с осторожностью предположить, что ассимилированный субстратмог быть представлен по преимуществу балтоязычными популяциями. Действительно, археологические данные указыва ют на очень широкое распространение балтских групп перед началом расселения славян. Балтскийсубстрату славян (правда, наряду с финно-угорским) выявляли и антропологи. Полученные нами генетические данные — и на графиках генетических взаимоотношений, и по доле общих фрагментов генома — указывают, что современные балтские народы являются ближайшими генетически ми соседями восточных славян. При этом балты являются и лингвистически ближайшими род ственниками славян. И можно полагать, что к моменту ассимиляции их генофонд не так сильно отличался от генофонда начавших свое широкое расселение славян. Поэтому если предположить,что расселяющиеся на восток славяне ассимилировали по преимуществу балтов, это может объяснить и сходство современных славянских и балтских народов друг с другом, и их отличия от окружающих их не балто-славянских групп Европы...В работе высказывается осторожное предположение, что ассимилированный субстрат мог быть представлен по преимуществу балтоязычными популяциями. Действительно, археологические данные указывают на очень широкое распространение балтских групп перед началом расселения славян. Балтский субстрат у славян (правда, наряду с финно-угорским) выявляли и антропологи. Полученные в этой работе генетические данные — и на графиках генетических взаимоотношений, и по доле общих фрагментов генома — указывают, что современные балтские народы являются ближайшими генетическими соседями восточных славян. ^ "The Genetics of Language and Farming Spread in India" (PDF). ^ Liu SH, N, Yilihamu, R Bake, et al. (2018), "A study of genetic diversity of three isolated populations in Xinjiang using Y-SNP." Acta Anthropologica Sinica, 2018, 37(1): 146-156. ArunKumar, G; Soria-Hernanz, DF; Kavitha, VJ; Arun, VS; Syama, A; Ashokan, KS (2012). "Population Differentiation of Southern Indian Male Lineages Correlates with Agricultural Expansions Predating the Caste System". PLoS ONE. 7 (11): e50269. Bibcode:2012PLoSO...750269A. doi:10.1371/journal.pone.0050269. PMC 3508930. PMID 23209694. "Y-DNA Haplogroup R and its Subclades". International Society of Genetic Genealogy (ISOGG). Retrieved 8 January 2011. Kivisild, T; Rootsi, S; Metspalu, M; Mastana, S; Kaldma, K; Parik, J; Metspalu, E; Adojaan, M; et al. (2003). "The Genetic Heritage of the Earliest Settlers Persists Both in Indian Tribal and Caste Populations". AJHG. 72 (2): 313–32. doi:10.1086/346068. PMC 379225. PMID 12536373. Krahn, Thomas; FTDNA; Genetic Genealogy Community. "Family Tree DNA Draft Y-Chromosome Tree". Archived from the original on 2013-05-26. Retrieved 2012-12-07. Mirabal, Sheyla; Regueiro, M; Cadenas, AM; Cavalli-Sforza, LL; Underhill, PA; Verbenko, DA; Limborska, SA; Herrera, RJ; et al. (2009). "Y-Chromosome distribution within the geo-linguistic landscape of northwestern Russia". European Journal of Human Genetics. 17 (10): 1260–1273. doi:10.1038/ejhg.2009.6. PMC 2986641. PMID 19259129. Regueiro, M; Cadenas, AM; Gayden, T; Underhill, PA; Herrera, RJ (2006). "Iran: Tricontinental Nexus for Y-Chromosome Driven Migration". Hum Hered. 61 (3): 132–143. doi:10.1159/000093774. PMID 16770078. Sahoo, S; Singh, A; Himabindu, G; Banerjee, J; Sitalaximi, T; Gaikwad, S; Trivedi, R; Endicott, P; et al. (2006). "A prehistory of Indian Y chromosomes: Evaluating demic diffusion scenarios". Proceedings of the National Academy of Sciences. 103 (4): 843–848. Bibcode:2006PNAS..103..843S. doi:10.1073/pnas.0507714103. PMC 1347984. PMID 16415161. Sengupta, S; Zhivotovsky, LA; King, R; Mehdi, SQ; Edmonds, CA; Chow, CE; Lin, AA; Mitra, M; et al. (2006). "Polarity and Temporality of High-Resolution Y-Chromosome Distributions in India Identify Both Indigenous and Exogenous Expansions and Reveal Minor Genetic Influence of Central Asian Pastoralists". American Journal of Human Genetics. 78 (2): 202–21. doi:10.1086/499411. PMC 1380230. PMID 16400607. Sharma, S; Rai, E; Sharma, P; Jena, M; Singh, S; Darvishi, K; Bhat, AK; Bhanwer, AJ; et al. (2009). "The Indian origin of paternal haplogroup R1a1(*)substantiates the autochthonous origin of Brahmins and the caste system". Journal of Human Genetics. 54 (1): 47–55. doi:10.1038/jhg.2008.2. PMID 19158816. Semino, O.; Passarino, G; Oefner, PJ; Lin, AA; Arbuzova, S; Beckman, LE; De Benedictis, G; Francalacci, P; et al. (2000). "The Genetic Legacy of Paleolithic Homo sapiens sapiens in Extant Europeans: A Y Chromosome Perspective" (PDF). Science. 290 (5494): 1155–59. Bibcode:2000Sci...290.1155S. doi:10.1126/science.290.5494.1155. PMID 11073453. Archived from the original (PDF) on 2003-11-25. .
Thangaraj, Kumarasamy; Naidu, B. Prathap; Crivellaro, Federica; Tamang, Rakesh; Upadhyay, Shashank; Sharma, Varun Kumar; Reddy, Alla G.; Walimbe, S. R.; Chaubey, Gyaneshwer; Kivisild, T; Singh, L; et al. (2010). Cordaux, Richard, ed. "The Influence of Natural Barriers in Shaping the Genetic Structure of Maharashtra Populations". PLoS ONE. 5 (12): e15283. Bibcode:2010PLoSO...515283T. doi:10.1371/journal.pone.0015283. PMC 3004917. PMID 21187967. Underhill, Peter A; Myres, Natalie M; Rootsi, Siiri; Metspalu, Mait; Zhivotovsky, Lev A; King, Roy J; Lin, Alice A; Chow, Cheryl-Emiliane T; et al. (2009). "Separating the post-Glacial coancestry of European and Asian Y chromosomes within haplogroup R1a". European Journal of Human Genetics. 18 (4): 479–84. doi:10.1038/ejhg.2009.194. PMC 2987245. PMID 19888303. Y Chromosome Consortium "YCC" (2002). "A Nomenclature System for the Tree of Human Y-Chromosomal Binary Haplogroups". Genome Research. 12 (2): 339–348. doi:10.1101/gr.217602. PMC 155271. PMID 11827954. Adams, Susan M.; Bosch, E; Balaresque, PL; Ballereau, SJ; Lee, AC; Arroyo, E; López-Parra, AM; Aler, M; et al. (2008). "The Genetic Legacy of Religious Diversity and Intolerance: Paternal Lineages of Christians, Jews, and Muslims in the Iberian Peninsula". American Journal of Human Genetics. 83 (6): 725–36. doi:10.1016/j.ajhg.2008.11.007. PMC 2668061. PMID 19061982. Al Zahery, N.; Semino, O.; Benuzzi, G.; Magri, C.; Passarino, G.; Torroni, A.; Santachiara-Benerecetti, A.S. (2003). "Y-chromosome and mtDNA polymorphisms in Iraq, a crossroad of the early human dispersal and of post-Neolithic migrations" (PDF). Molecular Phylogenetics and Evolution. 28 (3): 458–72. doi:10.1016/S1055-7903(03)00039-3. PMID 12927131. Archived from the original (PDF) on 2010-12-27. Retrieved 2009-09-12. Balanovsky, O; Rootsi, S; Pshenichnov, A; Kivisild, T; Churnosov, M; Evseeva, I; Pocheshkhova, E; Boldyreva, M; et al. (2008). "Two Sources of the Russian Patrilineal Heritage in Their Eurasian Context". American Journal of Human Genetics. 82 (1): 236–250. doi:10.1016/j.ajhg.2007.09.019. PMC 2253976. PMID 18179905. Bamshad, M.; Kivisild, T; Watkins, WS; Dixon, ME; Ricker, CE; Rao, BB; Naidu, JM; Prasad, BV; et al. (2001). "Genetic evidence on the origins of Indian caste populations". Genome Research. 11 (6): 994–1004. doi:10.1101/gr.GR-1733RR. PMC 311057. PMID 11381027. .
Barać, Lovorka; Pericić, Marijana; Klarić, Irena Martinović; Rootsi, Siiri; Janićijević, Branka; Kivisild, Toomas; Parik, Jüri; Rudan, Igor; et al. (July 2003). "Y chromosomal heritage of Croatian population and its island isolates" (PDF). European Journal of Human Genetics. 11 (7): 535–42. doi:10.1038/sj.ejhg.5200992. PMID 12825075. Battaglia, Vincenza; Fornarino, S; Al-Zahery, N; Olivieri, A; Pala, M; Myres, NM; King, RJ; Rootsi, S; et al. (2008). "Y-chromosomal evidence of the cultural diffusion of agriculture in southeast Europe". European Journal of Human Genetics. 17 (6): 820–30. doi:10.1038/ejhg.2008.249. PMC 2947100. PMID 19107149. Bouakaze, C.; Keyser, C; Amory, S; Crubézy, E; Ludes, B (2007). "First successful assay of Y-SNP typing by SNaPshot minisequencing on ancient DNA". International Journal of Legal Medicine. 121 (6): 493–9. doi:10.1007/s00414-007-0177-3. PMID 17534642. Bowden, G. R.; Balaresque, P; King, TE; Hansen, Z; Lee, AC; Pergl-Wilson, G; Hurley, E; Roberts, SJ; et al. (2008). "Excavating Past Population Structures by Surname-Based Sampling: The Genetic Legacy of the Vikings in Northwest England". Molecular Biology and Evolution. 25 (2): 301–309. doi:10.1093/molbev/msm255. PMC 2628767. PMID 18032405. Braya, Steven; Mullea, Jennifer; Dodda, Anne; Pulver, Ann; Wooding, Stephen; Warren, Stephen (2010). "Signatures of founder effects, admixture, and selection in the Ashkenazi Jewish population". PNAS. 107 (37): 16222–16227. Bibcode:2010PNAS..10716222B. doi:10.1073/pnas.1004381107. PMC 2941333. PMID 20798349. Capelli, C; Redhead, N; Abernethy, JK; Gratrix, F; Wilson, JF; Moen, T; Hervig, T; Richards, M; et al. (2003). "A Y Chromosome Census of the British Isles". Current Biology. 13 (11): 979–84. Bibcode:1996CBio....6.1213A. doi:10.1016/S0960-9822(03)00373-7. PMID 12781138. Archived from the original on 2008-01-21. also at "University College London" (PDF). Cinnioğlu, C; King, R; Kivisild, T; Kalfoğlu, E; Atasoy, S; Cavalleri, GL; Lillie, AS; Roseman, CC; et al. (2004). "Excavating Y-chromosome haplotype strata in Anatolia". Hum Genet. 114 (2): 127–48. doi:10.1007/s00439-003-1031-4. PMID 14586639. Cordaux, Richard; Aunger, R; Bentley, G; Nasidze, I; Sirajuddin, SM; Stoneking, M (2004). "Independent Origins of Indian Caste and Tribal Paternal Lineages". Current Biology. 14 (3): 231–235. Bibcode:1996CBio....6.1213A. doi:10.1016/j.cub.2004.01.024. PMID 14761656. Dupuy, Berit Myhre; Stenersen, M; Lu, TT; Olaisen, B (2005). "Geographical heterogeneity of Y-chromosomal lineages in Norway" (PDF). Forensic Science International. 164 (1): 10–19. doi:10.1016/j.forsciint.2005.11.009. PMID 16337760. Firasat, Sadaf; Khaliq, S; Mohyuddin, A; Papaioannou, M; Tyler-Smith, C; Underhill, PA; Ayub, Q (2006). "Y-chromosomal evidence for a limited Greek contribution to the Pathan population of Pakistan". European Journal of Human Genetics. 15 (1): 121–126. doi:10.1038/sj.ejhg.5201726. PMC 2588664. PMID 17047675. Flores, Carlos; Maca-Meyer, N; Larruga, JM; Cabrera, VM; Karadsheh, N; Gonzalez, AM (2005). "Isolates in a corridor of migrations: a high-resolution analysis of Y-chromosome variation in Jordan". Journal of Human Genetics. 50 (9): 435–441. doi:10.1007/s10038-005-0274-4. PMID 16142507. Fornarino, Simona; Pala, Maria; Battaglia, Vincenza; Maranta, Ramona; Achilli, Alessandro; Modiano, Guido; Torroni, Antonio; Semino, Ornella; Santachiara-Benerecetti, Silvana A (2009). "Mitochondrial and Y-chromosome diversity of the Tharus (Nepal): a reservoir of genetic variation". BMC Evolutionary Biology. 9: 154. doi:10.1186/1471-2148-9-154. PMC 2720951. PMID 19573232. Gimbutas (1970). Indo-European and Indo-Europeans. Univ. of Pennsylvania Press, Philadelphia, PA. pp. 155–195. Gwozdz (2009). "Y-STR Mountains in Haplospace, Part II: Application to Common Polish Clades" (PDF). Journal of Genetic Genealogy. 5 (2). Haak, W.; Brandt, G.; Jong, H. N. d.; Meyer, C.; Ganslmeier, R.; Heyd, V.; Hawkesworth, C.; Pike, A. W. G.; et al. (2008). "Ancient DNA, Strontium isotopes, and osteological analyses shed light on social and kinship organization of the Later Stone Age". Proceedings of the National Academy of Sciences. 105 (47): 18226–18231. Bibcode:2008PNAS..10518226H. doi:10.1073/pnas.0807592105. PMC 2587582. PMID 19015520. Hammer, Michael F.; Behar, Doron M.; Karafet, Tatiana M.; Mendez, Fernando L.; Hallmark, Brian; Erez, Tamar; Zhivotovsky, Lev A.; Rosset, Saharon; Skorecki, Karl (2009). "Response". Human Genetics. 126 (5): 725–726. doi:10.1007/s00439-009-0747-1. Helgason, A; Sigureardottir, S; Nicholson, J; Sykes, B; Hill, E; Bradley, D; Bosnes, V; Gulcher, J; et al. (2000). "Estimating Scandinavian and Gaelic Ancestry in the Male Settlers of Iceland". American Journal of Human Genetics. 67 (3): 697–717. doi:10.1086/303046. PMC 1287529. PMID 10931763. Karafet, T. M.; Mendez, F. L.; Meilerman, M. B.; Underhill, P. A.; Zegura, S. L.; Hammer, M. F. (2008). "New binary polymorphisms reshape and increase resolution of the human Y chromosomal haplogroup tree". Genome Research. 18 (5): 830–838. doi:10.1101/gr.7172008. ISSN 1088-9051. PMC 2336805. PMID 18385274. See also Supplementary Material. Kayser, M; Lao, O; Anslinger, K; Augustin, C; Bargel, G; Edelmann, J; Elias, S; Heinrich, M; et al. (2005). "Significant genetic differentiation between Poland and Germany follows present-day political borders, as revealed by Y-chromosome analysis". Human Genetics. 117 (5): 428–443. doi:10.1007/s00439-005-1333-9. PMID 15959808. A copy can be found here . Keyser; et al. (2009). "Ancient DNA provides new insights into the history of south Siberian Kurgan people". Human Genetics. 126 (3): 395–410. doi:10.1007/s00439-009-0683-0. PMID 19449030. Kharkov, V. N.; Stepanov, V. A.; Borinskaya, S. A.; Kozhekbaeva, Zh. M.; Gusar, V. A.; Grechanina, E. Ya. ; Puzyrev, V. P.; Khusnutdinova, E. K.; Yankovsky, N. K. (2004). "Gene Pool Structure of Eastern Ukrainians as Inferred from the Y-Chromosome Haplogroups". Russian Journal of Genetics. 40 (3): 326–331. doi:10.1023/B:RUGE.0000021635.80528.2f. A copy can be found here . Kharkov, V. N.; Stepanov, V. A.; Feshchenko, S. P.; Borinskaya, S. A.; Yankovsky, N. K.; Puzyrev, V. P. (2005). "Frequencies of Y Chromosome Binary Haplogroups in Belarusians". Russian Journal of Genetics. 41 (8): 928–931. doi:10.1007/s11177-005-0182-x. A copy can be found here . Kharkov, V. N.; Stepanov, V. A.; Medvedeva, O. F.; Spiridonova, M. G.; Voevoda, M. I.; Tadinova, V. N.; Puzyrev, V. P. (2007). "Gene Pool Differences between Northern and Southern Altaians Inferred from the Data on Y-Chromosomal Haplogroups" (PDF). Russian Journal of Genetics. 43 (5): 551–562. doi:10.1134/S1022795407050110. King, RJ; Ozcan, SS; Carter, T; Kalfoğlu, E; Atasoy, S; Triantaphyllidis, C; Kouvatsi, A; Lin, AA; et al. (2008). "Differential Y-chromosome Anatolian Influences on the Greek and Cretan Neolithic" (PDF). Annals of Human Genetics. 72 (Pt 2): 205–214. doi:10.1111/j.1469-1809.2007.00414.x. PMID 18269686. Archived from the original (PDF) on 2009-03-05. Lalueza-Fox, C.; Robello, M; Mao, C; Mainardi, P; Besio, G; Pettener, D.; Bertranpetit, J. (2004). "Unravelling migrations in the steppe: mitochondrial DNA sequences from ancient central Asians". Proc. Biol. Sci. 271 (1542): 941–947. doi:10.1098/rspb.2004.2698. PMC 1691686. PMID 15255049. Lell, JT; Sukernik, RI; Starikovskaya, YB; Su, B; Jin, L; Schurr, TG; Underhill, PA; Wallace, DC (2002). "The Dual Origin and Siberian Affinities of Native American Y Chromosomes" (PDF). American Journal of Human Genetics. 70 (1): 192–206. doi:10.1086/338457. PMC 384887. PMID 11731934. Archived from the original (PDF) on 2008-05-09. Luca, F; Di Giacomo, F; Benincasa, T; Popa, LO; Banyko, J; Kracmarova, A; Malaspina, P; Novelletto, A; Brdicka, R (2006). "Y-Chromosomal Variation in the Czech Republic". American Journal of Physical Anthropology. 132 (1): 132–9. doi:10.1002/ajpa.20500. PMID 17078035. Mukherjee, Namita; Nebel, Almut; Oppenheim, Ariella; Majumder, Partha P. (2001). "High-resolution analysis of Y-chromosomal polymorphisms reveals signatures of population movements from central Asia and West Asia into India". Journal of Genetics (published December 2001). 80 (3): 125–135. doi:10.1007/BF02717908. PMID 11988631. .
Nasidze, I; Ling, EY; Quinque, D; Dupanloup, I; Cordaux, R; Rychkov, S; Naumova, O; Zhukova, O; et al. (2004). "Mitochondrial DNA and Y-Chromosome Variation in the Caucasus" (PDF). Annals of Human Genetics. 68 (Pt 3): 205–221. doi:10.1046/j.1529-8817.2004.00092.x. PMID 15180701. Archived from the original (PDF) on 2004-10-30. Nasidze, Ivan; Quinque, D; Ozturk, M; Bendukidze, N; Stoneking, M (2005). "MtDNA and Y-chromosome Variation in Kurdish Groups" (PDF). Annals of Human Genetics. 69 (Pt 4): 401–412. doi:10.1046/j.1529-8817.2005.00174.x. PMID 15996169. Archived from the original (PDF) on 2009-08-23. Nebel, Almut; Filon, Dvora; Brinkmann, Bernd; Majumder, Partha; Faerman, Marina; Oppenheim, Ariella (2001). "The Y Chromosome Pool of Jews as Part of the Genetic Landscape of the Middle East". American Journal of Human Genetics. 69 (5): 1095–112. doi:10.1086/324070. PMC 1274378. PMID 11573163. Passarino, G; Semino, Ornella; Magria, Chiara; Al-Zahery, Nadia; Benuzzi, Giorgia; Quintana-Murci, Lluis; Andellnovic, Slmun; Bullc-Jakus, Floriana; et al. (2001). "The 49a,f haplotype 11 is a new marker of the EU19 lineage that traces migrations from northern regions of the black sea". Hum. Immunol. 62 (9): 922–932. doi:10.1016/S0198-8859(01)00291-9. PMID 11543894. Passarino, Giuseppe; Cavalleri, GL; Lin, AA; Cavalli-Sforza, LL; Børresen-Dale, AL; Underhill, PA (2002). "Different genetic components in the Norwegian population revealed by the analysis of mtDNA and Y chromosome polymorphisms". European Journal of Human Genetics. 10 (9): 521–9. doi:10.1038/sj.ejhg.5200834. PMID 12173029. .
Pawlowski, R; Dettlaff-Kakol, A; MacIejewska, A; Paszkowska, R; Reichert, M; Jezierski, G (2002). "Population genetics of 9 Y-chromosome STR loci w Northern Poland". Arch. Med. Sadowej Kryminol. 52 (4): 261–277. PMID 14669672. Pericić, M.; Lauc, LB; Klarić, IM; Rootsi, S; Janićijević, B; Rudan, I; Terzić, R; Colak, I; et al. (2005). "High-resolution phylogenetic analysis of southeastern Europe traces major episodes of paternal gene flow among Slavic populations". Mol. Biol. Evol. 22 (10): 1964–75. doi:10.1093/molbev/msi185. PMID 15944443. .
Qamar, R; Ayub, Q; Mohyuddin, A; Helgason, A; Mazhar, K; Mansoor, A; Zerjal, T; Tylersmith, C; Mehdi, S (2002). "Y-Chromosomal DNA Variation in Pakistan". American Journal of Human Genetics. 70 (5): 1107–24. doi:10.1086/339929. PMC 447589. PMID 11898125. Quintana-Murci, L; Krausz, C; Zerjal, T; Sayar, SH; Hammer, MF; Mehdi, SQ; Ayub, Q; Qamar, R; et al. (2001). "Y-chromosome lineages trace diffusion of people and languages in southwestern Asia". American Journal of Human Genetics. 68 (2): 537–542. doi:10.1086/318200. PMC 1235289. PMID 11133362. Rebala, Krzysztof; Mikulich, AI; Tsybovsky, IS; Siváková, D; Džupinková, Z; Szczerkowska-Dobosz, A; Szczerkowska, Z (2007). "Y-STR variation among Slavs: evidence for the Slavic homeland in the middle Dnieper basin". Journal of Human Genetics. 52 (5): 406–414. doi:10.1007/s10038-007-0125-6. PMID 17364156. Rosser, ZH; Zerjal, T; Hurles, ME; Adojaan, M; Alavantic, D; Amorim, A; Amos, W; Armenteros, M; et al. (2000). "Y-Chromosomal Diversity in Europe Is Clinal and Influenced Primarily by Geography, Rather than by Language". American Journal of Human Genetics. 67 (6): 1526–1543. doi:10.1086/316890. PMC 1287948. PMID 11078479. Archived from the original on 2008-05-06. Saha, Anjana; Sharma, S; Bhat, A; Pandit, A; Bamezai, R (2005). "Genetic affinity among five different population groups in India reflecting a Y-chromosome gene flow". Journal of Human Genetics. 50 (1): 49–51. doi:10.1007/s10038-004-0219-3. PMID 15611834. .
Sanchez, J; Børsting, C; Hallenberg, C; Buchard, A; Hernandez, A; Morling, N (2003). "Multiplex PCR and minisequencing of SNPs—a model with 35 Y chromosome SNPs". Forensic Sci Int. 137 (1): 74–84. doi:10.1016/S0379-0738(03)00299-8. PMID 14550618. Scozzari, R; Cruciani, F; Pangrazio, A; Santolamazza, P; Vona, G; Moral, P; Latini, V; Varesi, L; et al. (2001). "Human Y-Chromosome Variation in the Western Mediterranean Area: Implications for the Peopling of the Region" (PDF). Human Immunology. 62 (9): 871–84. CiteSeerX 10.1.1.408.4857. doi:10.1016/S0198-8859(01)00286-5. PMID 11543889. Sharma (2007). "The Autochthonous Origin and a Tribal Link of Indian Brahmins: Evaluation Through Molecular Genetic Markers" (PDF). THE AMERICAN SOCIETY OF HUMAN GENETICS 57th Annual Meeting. Shilz (2006). "Molekulargenetische Verwandtschaftsanalysen am prähistorischen Skelettkollektiv der Lichtensteinhöhle, Dissertation, Göttingen" (PDF). Soares, Pedro; Achilli, Alessandro; Semino, Ornella; Davies, William; MacAulay, Vincent; Bandelt, Hans-JüRgen; Torroni, Antonio; Richards, Martin B. (2010). "The Archaeogenetics of Europe". Current Biology. 20 (4): R174–83. Bibcode:1996CBio....6.1213A. doi:10.1016/j.cub.2009.11.054. PMID 20178764. Tambets, K; Rootsi, S; Kivisild, T; Help, H; Serk, P; Loogväli, EL; Tolk, HV; Reidla, M; et al. (2004). "The Western and Eastern Roots of the Saami—the Story of Genetic 'Outliers' Told by Mitochondrial DNA and Y Chromosomes". American Journal of Human Genetics. 74 (4): 661–682. doi:10.1086/383203. PMC 1181943. PMID 15024688. Thanseem, Ismail; Thangaraj, Kumarasamy; Chaubey, Gyaneshwer; Singh, Vijay Kumar; Bhaskar, Lakkakula VKS; Reddy, B Mohan; Reddy, Alla G; Singh, Lalji (2006). "Genetic affinities among the lower castes and tribal groups of India: inference from Y chromosome and mitochondrial DNA". BMC Genetics. 7: 42. doi:10.1186/1471-2156-7-42. PMC 1569435. PMID 16893451. Varzari, Alexander (2006). "Population History of the Dniester-Carpathians: Evidence from Alu Insertion and Y-Chromosome Polymorphisms" (PDF). Dissertation der Fakultät für Biologie der Ludwig-Maximilians-Universität München. Völgyi, Antónia; Zalán, Andrea; Szvetnik, Enikő; Pamjav, Horolma (2008). "Hungarian population data for 11 Y-STR and 49 Y-SNP markers". Forensic Science International: Genetics. 3 (2): e27–8. doi:10.1016/j.fsigen.2008.04.006. PMID 19215861. Wang, Wei; Wise, Cheryl; Baric, Tom; Black, Michael L.; Bittles, Alan H. (2003). "The origins and genetic structure of three co-resident Chinese Muslim populations: The Salar, Bo'an and Dongxiang". Human Genetics. 113 (3): 244–52. doi:10.1007/s00439-003-0948-y. PMID 12759817. Weale, S; Zhivotovsky, LA; King, R; Mehdi, SQ; Edmonds, CA; Chow, CE; Lin, AA; Mitra, M; Sil, SK (2002). "Y Chromosome Evidence for Anglo-Saxon Mass Migration" (PDF). Mol. Biol. Evol. 19 (7): 1008–1021. doi:10.1093/oxfordjournals.molbev.a004160. PMID 12082121. .
Wells, Spencer (2002). The Journey of Man: A Genetic Odyssey. Princeton University Press. ISBN 978-0-691-11532-0. .
Wilson, J. F.; Weiss, DA; Richards, M; Thomas, MG; Bradman, N; Goldstein, DB (2001). "Genetic evidence for different male and female roles during cultural transitions in the British Isles". Proc. Natl. Acad. Sci. U.S.A. 98 (9): 5078–5083. Bibcode:2001PNAS...98.5078W. doi:10.1073/pnas.071036898. PMC 33166. PMID 11287634. Yan, Shi; Wang, Chuan-Chao; Zheng, Hong-Xiang; Wang, Wei; Qin, Zhen-Dong; Wei, Lan-Hai; Wang, Yi; Pan, Xue-Dong; Fu, Wen-Qing; He, Yun-Gang; Xiong, Li-Jun; Jin, Wen-Fei; Li, Shi-Lin; An, Yu; Li, Hui; Jin, Li; Su, Bing (29 August 2014). "Y Chromosomes of 40% Chinese Descend from Three Neolithic Super-Grandfathers". PLoS ONE. 9 (8): e105691. doi:10.1371/journal.pone.0105691. PMC 4149484. PMID 25170956. Zerjal, T; Beckman, L; Beckman, G; Mikelsaar, AV; Krumina, A; Kucinskas, V; Hurles, ME; Tyler-Smith, C (2001). "Geographical, linguistic, and cultural influences on genetic diversity: Y-chromosomal distribution in Northern European populations". Mol Biol Evol. 18 (6): 1077–1087. doi:10.1093/oxfordjournals.molbev.a003879. PMID 11371596. Zerjal, T; Wells, RS; Yuldasheva, N; Ruzibakiev, R; Tyler-Smith, C (2002). "A Genetic Landscape Reshaped by Recent Events: Y-Chromosomal Insights into Central Asia". American Journal of Human Genetics. 71 (3): 466–482. doi:10.1086/342096. PMC 419996. PMID 12145751. Zhou, Ruixia; An, Lizhe; Wang, Xunling; Shao, Wei; Lin, Gonghua; Yu, Weiping; Yi, Lin; Xu, Shijian; et al. (2007). "Testing the hypothesis of an ancient Roman soldier origin of the Liqian people in northwest China: a Y-chromosome perspective". Journal of Human Genetics. 52 (7): 584–91. doi:10.1007/s10038-007-0155-0. PMID 17579807. Zhao, Zhongming; Khan, Faisal; Borkar, Minal; Herrera, Rene; Agrawal, Suraksha (2009). "Presence of three different paternal lineages among North Indians: A study of 560 Y chromosomes". Annals of Human Biology. 36 (1): 1–14. doi:10.1080/03014460802558522. PMC 2755252. PMID 19058044. Zhivotovsky, L; Underhill, PA; Cinnioğlu, C; Kayser, M; Morar, B; Kivisild, T; Scozzari, R; Cruciani, F; et al. (2004). "The effective mutation rate at Y chromosome short tandem repeats, with application to human population-divergence time". American Journal of Human Genetics. 74 (1): 50–61. doi:10.1086/380911. PMC 1181912. PMID 14691732. Wikimedia Commons has media related to Haplogroup R1a of Y-DNA. This page was last edited on 17 April 2019, at 04:37 (UTC).